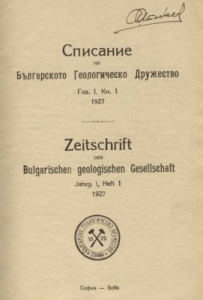 The Bulgarian Geological Society publishes scientific periodicals and non-periodicals. The Review of BGS is a scientific periodical which publishing starts in 1927. Its main purpose is to popularize the scientific achievements of Bulgarian and foreign geologists. The publishing is financed by the Bulgarian Geological Society by means of membership dues, sponsorship from BAS and other organizations and companies. During its existence either three or one issue has been published per year. The Review of BGD is being distributed among the geological association through annual subscription or exchange in 44 countries. Summaries of the papers included in the issues of the Review of BGS and in the materials of the Annual Scientific Conferences are E-published on the present site. Full text of a definite article can be submitted on request through the authors E-address as well as on yotzo_yanev@yahoo.com. or on postal address: “Acad. Georgi Bonchev” str., bl. 24, Geological Institute of BAS, Sofia 1113, Bulgaria, Dr. Yotzo Yanev, editor-in-chief. Beside its Review the society publishes scientific non-periodicals. The materials of the Annual Scientific Conference are published yearly. The society publishes also separate books and monographs of scientific and popular character.